Source: Jason South, courtesy of The Age. The bushfires of Black Saturday, 7 February 2009, caused the death of 173 people. Black Saturday wrote itself into Victoria’s history with record-breaking weather conditions and bushfires of a scale and ferocity that tested human endurance. The lives of many Victorians were changed forever, and many showed they are capable of deeds of great courage and compassion. Although some communities were physically destroyed, their members also displayed ingenuity, strength and resolve in the face of this calamity. There was also widespread devastation of considerable areas of the scenic forests and woodlands that form part of Victoria’s natural heritage. part of Victoria’s landscape, and if time dims our memory we risk repeating the mistakes of the past. We need to learn from the experiences of Black Saturday and improve the way we prepare for and respond to bushfires. The 2009 Victorian Bushfires Royal Commission was an important part of ensuring that those lessons are clearly defined and learnt. The Commission conducted an extensive investigation into the causes of, the preparation for, the response to and the impact of the fires that burned throughout Victoria in late January and February 2009. As Commissioners, we concentrated on gaining an understanding of precisely what took place and how the risks of such a tragedy recurring might be reduced. In our deliberations we ensured that the voices of affected community members were heard. Our priority was to listen to people directly affected by the fires. We also ensured that the Commission’s processes were firmly based in the community through open hearings (including in regional towns), web streaming so that people could listen to the hearings over the internet, public submissions, the participation of lay witnesses, the creation of the Black Saturday Gallery, and the participation of family and friends in hearings about people who died as a result of the fires. This access will continue: the Commission’s website will remain active, and all the Commission’s documentation will be available at the Public Records Office of Victoria. This report is an important part of securing the memory of the fires. The first volume describes the origins and course of the 15 fires that wrought the greatest harm on 7 February and the response to them. It also tells the stories of the 173 people who died. Volume II looks at what lessons can be learnt from these experiences—how we can reduce the risk and impacts of fire and minimise fire-related loss of life in future. Volume III reports on the Commission’s administration and processes. Volume IV reproduces the statements of the 100 lay witnesses who gave personal accounts of their experiences in the fires in late January and February and in their aftermath. The stories told by these people grounded our work. They continually reminded all at the Commission that bushfires deeply affect people and communities and that their needs and safety must be at the forefront of government policy. The recommendations we make give priority to protecting human life, and they are designed to reflect the shared responsibility that governments, fire agencies, communities and individuals have for minimising the prospect of a tragedy of this scale ever happening again. We offer this report to the Governor and the people of Victoria. Source: Courtesy of Alex Ip. Victoria endured one of its most severe and prolonged heatwaves during the final week of January 2009. The temperature in Melbourne was above 43°C for three consecutive days for the first time since records had been kept. Saturday 7 February was forecast to reach temperatures in the low 40s, accompanied by strong winds. In the lead-up to the day the Premier of Victoria, the Hon. John Brumby MP, described the state as ‘tinder dry’. The Country Fire Authority and the Department of Sustainability and Environment, the State’s primary bushfire agencies, warned that forests and grasslands were the driest they had been since the Ash Wednesday fires in 1983. The conditions forecast for 7 February were realised, as were people’s worst fears when fires broke out across the state. Temperatures were nearing 40°C by 11.00 am in many parts of the state and later climbed to the mid-40s. Numerous areas endured record-breaking maximums—including Melbourne, which reached 46.4°C. Strong winds in the morning grew to storm force as the day progressed, and a wind change moved across the state during the afternoon, greatly intensifying the fires. The Commission was informed that the CFA and DSE attended or patrolled 316 grass, scrub or forest fires on that day. Of these, the Commission examined in detail 15 fires that caused (or had the potential to cause) the greatest damage. The most serious consequence of the fires was the death of 173 people. Left behind are families, friends and communities still trying to come to terms with their loss. Accompanying this loss of life is the fires’ impact on property and the infrastructure that supports communities, as well as the substantial environmental impact, which will take years to fully reveal itself—let alone be ameliorated. It is extremely difficult to quantify the cost of a disaster like this, but the Commission estimates it to be more than $4 billion. This was one of Australia’s worst natural disasters. It will be many years before its effects dim. Governments, fire and emergency services agencies and all individuals can learn valuable lessons from those days, so that we might reduce the risk of such destruction occurring again. It would be a mistake to treat Black Saturday as a ‘one-off’ event. With populations at the rural–urban interface growing and the impact of climate change, the risks associated with bushfire are likely to increase. In the days immediately following 7 February the State responded to the consequences of this disaster. A relief effort to deal with immediate needs was the first priority. But it was also clear that the community needed to understand this tragedy and how to minimise the risk of a similar tragedy occurring in the future. On 9 February 2009 the Premier announced the State’s intention to establish a royal commission. One week later the Hon. Bernard Teague AO, Susan Pascoe AM and Ronald McLeod AM were appointed as the Royal Commissioners. The Commission’s task was substantial. 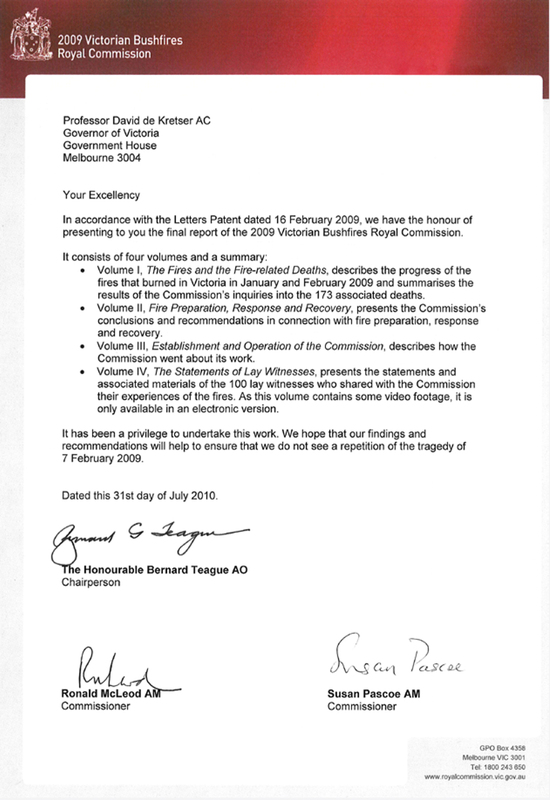 The Governor of Victoria, Professor David de Kretser AC, issued the letters patent, setting out the Commission’s terms of reference, on 16 February 2009 (see page 38). The Commission began its work that day, giving early priority to community engagement: between 18 March and 8 April it held 26 community consultations in fire-affected areas, seeking to learn about the experiences and concerns of individuals affected by the fires. A directions hearing was held on 20 April 2009, and the hearing of evidence began on 11 May 2009 and concluded on 27 May 2010. During that time the Commission held 155 days of hearings—including eight days of regional hearings and 23 days examining the 173 fire-related deaths. To conduct this inquiry properly the Commission needed to ground its work in an understanding of the reality of bushfire and its effects on people’s lives. This imperative permeated the Commission’s work, from the initial community consultations to the public submissions, the 100 lay witnesses who gave personal accounts of their experiences, and the involvement and support given to the families who attended the hearings into the fire-related deaths. The Commission felt that its work could, and should, contribute to individual and community healing, as well as accommodate the strong public interest in the inquiry. This commitment to people went beyond the requirement to ensure natural justice for represented parties and those potentially affected by the Commission’s findings and recommendations: as much as possible, the people who were most directly affected by the fires were given a voice and their stories and views were heard. The Commission views protection of human life and the safety of communities as the highest priority for bushfire policy and directed its efforts accordingly. This priority guided the Commission in its analysis, the collection of evidence, its reports and the formulation of its recommendations. The recommendations further reflect the Commission’s recognition that individuals, fire agencies and Commonwealth, State and local governments share responsibility for preparing for fire and improving people’s safety. While placing the preservation of human life at the heart of its deliberations, the Commission also sought to ensure that due consideration was given to Victoria’s environmental sustainability. 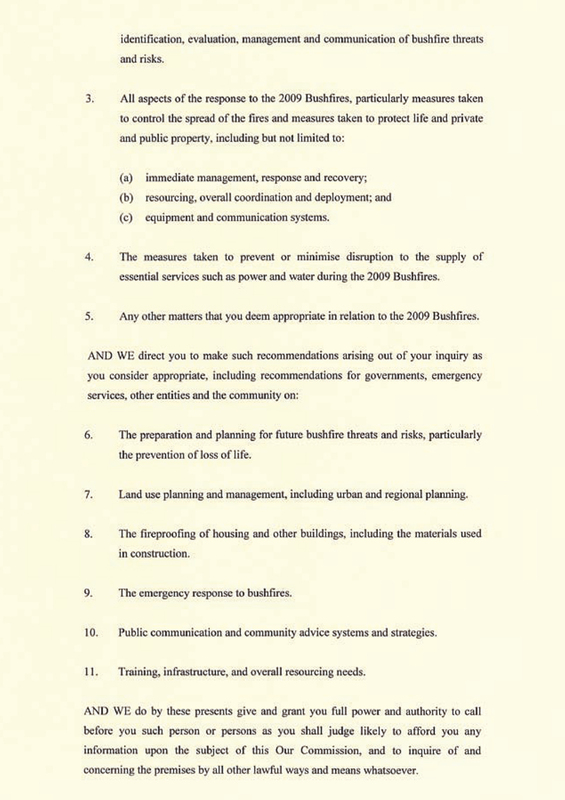 The Commission was asked to inquire into and report on the causes and circumstances of the fires that burned in January–February 2009, the preparation and planning before the fires, all aspects of the response to the fires, measures taken in relation to utilities, and any other matters it considered appropriate. 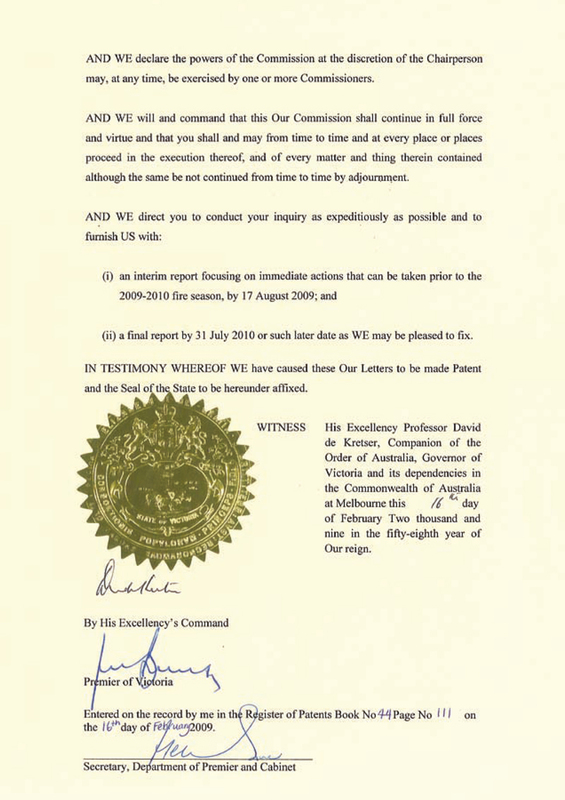 The letters patent directed the Commission to make such recommendations as it thought fit on preparation and planning for further fire threats and risks, land-use planning and management, fireproofing of structures, emergency response, communication, training, infrastructure and overall resourcing. These fires were not the only ones that occurred during the 2008–09 bushfire season: DSE and CFA staff and volunteers fought hundreds of fires. The fire season was long and demanding, placing considerable pressure on firefighters even before the worst fires began in early February. Figure 1 shows the extent of the fires of January–February 2009. Victoria has a long, sometimes devastating, history of fire. 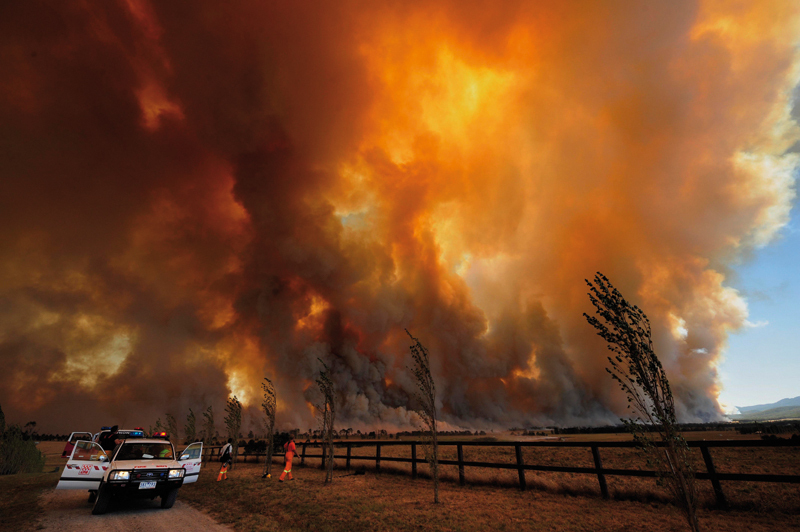 The conditions on 7 February gave rise to particularly destructive bushfires. 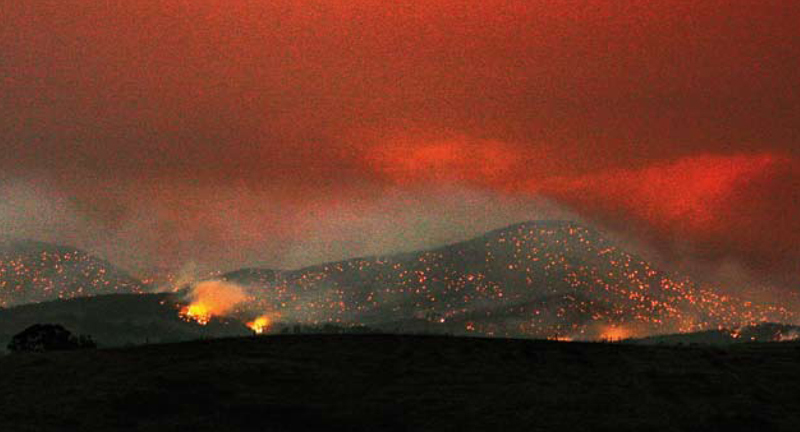 These very intense fires share some features that set them apart from less intense fires. Very dry fuels and strong surface winds resulted in erratic fire behaviour and the development of strong convective activity capable of lifting firebrands such as burning bark high in the convection column. Strong upper air winds transported burning bark downwind for many kilometres, resulting in long-distance fire spotting. Spotting was an important factor in the spread of some fires. Firebrands carried by the strong winds spread from one ridge top to the next in areas of broken terrain. They were carried across sparse eaten-out pasture or areas where grass was less than fully cured and might otherwise have arrested the fires’ spread. • Rapid fire spread followed ignition, which responding crews could not contain. • Fires crowned in forested areas, which made them impossible for ground crews to control. • Powerful convection columns were generated above the fires. • Extensive forward spotting occurred as a result of the fuel type, the weather conditions and the topography. • Late in the day a wind change altered the direction of fire spread and extended the firefront. The Commission acknowledges all those who placed their lives at risk to fight the fires that burned in Victoria in January–February 2009, and particularly on and after 7 February. Its gratitude extends to career firefighters from all the government agencies involved, volunteers, private units, industry brigades, police, and ambulance and other emergency services workers, as well as firefighters who came from interstate and overseas to help. Were it not for their efforts the damage and loss would have been even greater. The Commission particularly recognises the contribution of volunteers and their families. The strength of the CFA volunteer base was evident on 7 February; this includes its surge capacity, the local knowledge of its members and its rapid response. The Commission heard of volunteers preparing for the day, warning local residents and assisting with the confronting task of locating and identifying the dead. Countless more volunteers took up support roles. Although not well known, private units play an important role in firefighting in many parts of Victoria. They are usually operated by farmers or landowners, and their equipment usually consists of a small multi-purpose farm utility with a portable tank and pump mounted on the rear. Operators might be members of the CFA but this is not always the case. The operators of forest plantations above a certain size are required to have industry fire brigades. These brigades need only protect the plantation assets, but the plantation operator can, and often does, permit the brigade to operate outside its designated area. The Commission acknowledges the firefighting support provided by industry brigades and private units and encourages continued cooperation between public and private operators. It is a practical and valuable expression of shared responsibility that strengthens the state’s overall firefighting capacity. The greatest tragedy of Black Saturday, and one of the primary reasons why this Royal Commission was established, was that 173 people died as a result of the fires. This far exceeded the loss of life from any previous bushfires—including Ash Wednesday, in February 1983, when 75 people died in Victoria and South Australia. Five fires claimed people’s lives. The greatest loss resulted from the Kilmore East fire (119 people); it was followed by Murrindindi (40), Churchill (11), Beechworth-Mudgegonga (2) and Bendigo (1). The great majority of these people died on 7 February; four died in the following days or weeks as a result of the injuries they sustained on 7 February, and one person, an interstate firefighter, died as a result of injuries sustained after 7 February. The Commission heard many accounts from people who survived the 2009 bushfires, but it was only by examining the circumstances of the deaths that it could complete its investigation of these fires. In particular, the examination of the circumstances of the deaths helped the Commission expand its knowledge of the way people understand and respond to bushfire. These inquiries also cast light on its consideration of matters such as planning and building regulation, the need for a broad range of safety options, and what makes a home defendable against bushfire. The response to the fires on 7 February was characterised by many people trying their best in extraordinarily difficult circumstances. There were many examples of people who met the challenge admirably. Nevertheless, some poor decisions were made by people in positions of responsibility and by individuals seeking to protect their own safety. The Commission is conscious of the pressure and difficulties people faced on the day, but it would be negligent if it overlooked the shortcomings: we need to learn the lessons so that problems can be avoided in the future. The Commission therefore examined the policies, systems and structures needed to ensure that government, fire and emergency services agencies and individuals make informed, effective decisions about their response to bushfires in a way that protects life and minimises loss. 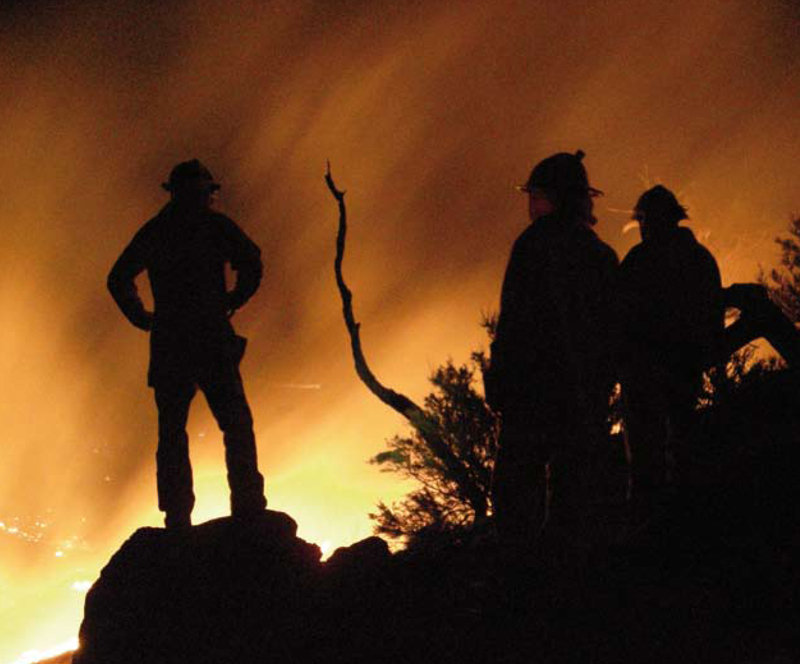 As the fires of January–February 2009 burned fire agencies and individuals made crucial decisions in the context of an overarching policy for community safety in bushfires. That policy had become known colloquially as ‘stay or go’ but is more accurately described by its full title, ‘Prepare, Stay and Defend or Leave Early’. As a result of its inquiries the Commission concludes that the central tenets of the stay or go policy remain sound. The 7 February fires did, however, severely test the policy and exposed weaknesses in the way it was applied. Leaving early is still the safest option. Staying to defend a well-prepared, defendable home is also a sound choice in less severe fires, but there needs to be greater emphasis on important qualifications. The policy is now in transition. Since 7 February the State has improved the policy and the community education campaign that accompanies it, including in response to the Commission’s interim recommendations. The Commission considers that, although the changes the State has made to date advance the policy, further change is needed. The stay or go policy failed to allow for the variations in fire severity that can result from differing topography, fuel loads and weather conditions. In particular, it did not adequately account for the ferocious fires experienced on Black Saturday. A bushfire safety policy must be capable of dealing with the fact that every fire is different and must differentiate potential firestorms from most bushfires. The most fierce fires call for a different approach to community safety, for different advice, support and responses from fire agencies. On such days, if the initial attack fails to contain a fire, the operational focus and mindset of fire agencies should move to providing information and attending to community safety rather than fire suppression. The stay or go policy tended to assume that individuals had a fire plan and knew what to do when warned of a bushfire threat. But many people did not have a well-thought-out plan and were left to make their own decisions without the benefit of assistance from the authorities. In addition, warnings—when they were given—were too narrow: they were directed at getting people to enact their fire plans, rather than giving more specific directions or advice. The Commission heard that many people wait and see what happens before leaving in response to one or more of a range of ‘triggers’, such as a fire being in their area, the situation becoming dangerous, or being personally told to leave. For these people the lack of alternatives—the provision of shelters and refuges or evacuation—became critical as a fallback option. Any policy must encourage people to adopt the lowest risk option available to them, which is to leave well before a bushfire arrives in the area. The Commission acknowledges, however, the reality that people will continue to wait and see, and a comprehensive bushfire policy must accommodate this by providing for more options and different advice. The State has accepted that the policy options of leaving early or staying to defend do not fully cover the need for contingency plans, but it still appears reluctant to implement alternatives, arguing that the availability of a suite of options could discourage some people from leaving early. The Commission is concerned that the State’s reluctance is reflected in the slow progress with community refuges and bushfire shelters. It simply does not face the reality that the earlier binary policy approach did not help many people who, for various reasons, did not find either option acceptable in their circumstances. Advice about bushfires must also be provided to the community in a way that engages them. The population exposed to fire on the urban fringes is growing and the demographics are changing. It is essential that there be a continued focus on providing frank and meaningful advice about the risks and what is required to adequately prepare for and survive a bushfire. Local planning and emergency management processes are also crucial to the formulation of this advice. The fact that not all houses are defendable in all circumstances was recognised before 7 February. In the Commission’s view this message needs to be conveyed more forcefully. An important observation from the circumstances of many of the fire-related deaths is that defendability is affected by the surrounding environment—not just the land and vegetation immediately adjacent to a house. Being close to a heavily forested area can increase the ferocity of an approaching fire and the likelihood of heavy ember attack, making it harder to defend a house. Defending a house also requires at least two able-bodied, fit and determined adults who are physically and mentally prepared to work long and hard in arduous and dangerous conditions. The rigours of mounting a defence in the face of fires such as those on Black Saturday caught many by surprise. The Commission finds it particularly worrying that nearly half of the people who died were classed as ‘vulnerable’ because they were aged less than 12 years or more than 70 years or because they were suffering from an acute or chronic illness or disability. Community education must continue to stress that staying in fire-prone areas on days when conditions are as severe as those on Black Saturday involves grave risk to one’s life. The policy approach also needs to recognise the important underlying principle of shared responsibility. A fundamental aspect of the Commission’s recommendations is that everyone—the State, municipal councils, individuals, household members and the broader community—must accept greater responsibility for bushfire safety in the future and that many of these responsibilities are shared. The Commission uses the expression ‘shared responsibility’ to mean increased responsibility for all. It recommends that State agencies and municipal councils adopt increased or improved protective, emergency management and advisory roles. In turn, communities, individuals and households need to take greater responsibility for their own safety and to act on advice and other cues given to them before and on the day of a bushfire. ‘Shared responsibility’ does not mean ‘equal responsibility’. The Commission considers that in some areas the State should assume greater responsibilities than others; for example, the State and its fire authorities are likely to be more able than individuals to identify the known risks about bushfire. It is also necessary for the State, municipal councils and families to recognise the specific needs of vulnerable people, who might need early warning, assistance or separate consideration particularly on code red days. • improving the quality and availability of advice on fire behaviour and house defendability and clearly conveying the message that among the risks of staying to defend are death and serious injury. To be effective these changes need to be part of a well-designed long-term community education program that captures people’s attention, makes allowance for local needs and circumstances, and is regularly evaluated and improved. Municipal councils should take a more active role in planning for bushfire, including planning for evacuation and shelter options in their municipalities. • sound advice for individuals, households and communities—including a mix of specific and general advice delivered through various modes and media. It will not be easy to maintain the focus on bushfire safety over time. Community memory of ferocious fires can fade because of the relative infrequency of such events. In these circumstances there is a risk of individual and collective underestimation of the risk—and possibly complacency. Individuals must remain vigilant, and the State should use community education and public awareness to break the cycle of complacency. Teaching bushfire history and safety in schools is important for maintaining community memory and awareness. Source: Courtesy of The Bendigo Advertiser. Finally, individual planning and action for bushfire safety can often involve hard decisions. For example, firefighting equipment and infrastructure are expensive, and some people in bushfire-prone areas who want to defend their homes might not have the financial means to prepare their home fully. Dilemmas such as this should be discussed in education programs under the revised bushfire safety policy. The revised policy needs to challenge people to think about what they would do if bushfire threatened on a work day, during school holidays or when they had other plans (such as a party). They also need to ask themselves whether they are physically and mentally strong enough to cope with the demands of a sustained firefight, what would they do if their plans fail, and how would they protect their pets and livestock or would they leave them. People need to face the fact that bushfires do not necessarily arrive at convenient times. Their planning needs to reflect this reality. The State’s emergency management framework provides for planning, preparation and coordination in the management of crises and natural disasters. On Black Saturday new state-level operational arrangements were being trialled by the CFA and DSE. 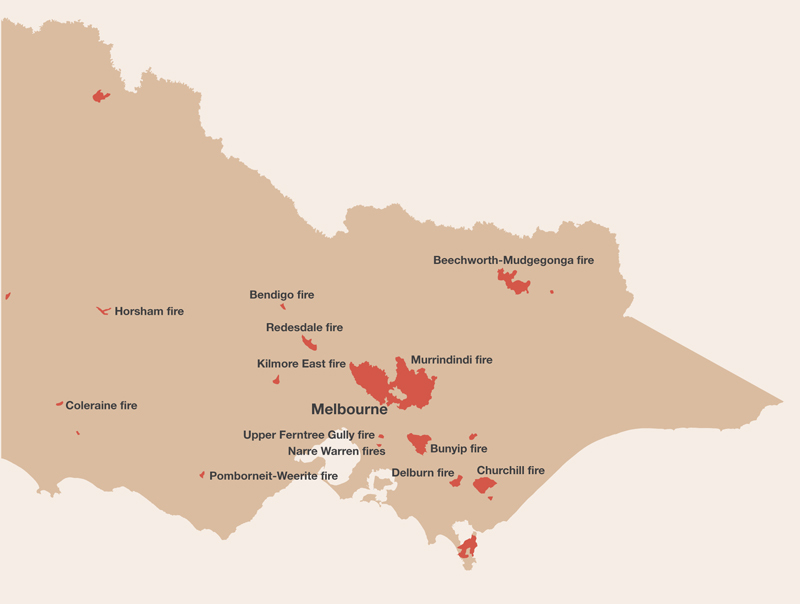 This was the first fire season (2008–09) that the agencies had been co-located and operating from the integrated Emergency Coordination Centre in Melbourne. The purpose of the iECC was to achieve effective strategic planning and coordination, better information sharing and faster decision making. People who worked at the iECC overwhelmingly considered that the outcome of the fires would have been far worse had the agencies not been co-located. The Commission agrees with this conclusion but further concludes that the state-level emergency management arrangements still faltered because of confusion about responsibilities and accountabilities and some important deficiencies of leadership. True integration was not achieved: the CFA and DSE followed operating procedures that were not fully consistent, used separate technology systems, and in many cases performed duplicate functions. The State has acknowledged some of these problems, and since 2009 systems at the iECC (now the State Control Centre) have been upgraded and the centre’s layout changed. The Commission endorses these improvements and supports the continued use of the State Control Centre for integrated emergency management. The experience of 7 February also highlighted several areas in which high-level state arrangements need reform. On Black Saturday the roles of the most senior personnel were not clear, and there was no single agency or individual in charge of the emergency. The Commission notes changes made as part of the new coordination, command and control arrangements but considers that more should be done. It recommends that the roles be clarified, including through organisational change. Even when the right policies and systems are in operation, strong and effective leadership is essential. On 7 February the leaders ultimately responsible for the operational response to the emergency were the Chief Officer of the CFA, Mr Russell Rees, the Chief Fire Officer of DSE, Mr Ewan Waller, and the Chief Commissioner of Police, Ms Christine Nixon. Although many of the functions associated with each individual’s role might have been delegated to subordinates, these people were still ultimately accountable. The Commission concludes that some elements of the leadership provided on 7 February were wanting. Mr Rees and Mr Waller ought to have done more in relation to warnings (this was dealt with in the Commission’s first interim report), supporting incident management teams and statewide planning. The Commission considers that Ms Nixon’s approach to emergency coordination was inadequate. Ms Nixon herself acknowledged that leaving the integrated Emergency Coordination Centre and going home at about 6.00 pm on 7 February was an error of judgment. The Commission shares this view. Although the Commission concludes that the Minister for Police and Emergency Services acted properly before and during the bushfires it considers that he should have raised the option of declaring a state of disaster with the Premier. The circumstances clearly met the criteria for such consideration. Even if practical cross-agency and community cooperation was already in evidence and no additional coercive powers were needed, such a declaration would have recognised the gravity of the situation and might have sharpened emergency agencies’ focus on community safety and warnings. In the Commission’s view, if circumstances potentially satisfy the criteria for declaring a state of disaster, the option of making such a declaration should be discussed with the Premier. The Commission not only looked at state-level management but also at the management of individual incidents. Overall, AIIMS (the Australasian Inter-service Incident Management System) was well understood and accepted by fire agencies. The Commission supports its continued use with some minor modifications to increase the profile of the Information Unit and recognition of the importance of local knowledge within level 3 incident management teams. At the local level, the performance of individual incident management teams varied on 7 February, and the experience of the day demonstrated how important effective preparation is to good performance. It was invariably those IMTs that were well prepared, staffed by people with the appropriate training and experience, and well practised that managed difficult fires well. The Commission commends these groups for their planning and preparation. Problems that arose where this did not occur led the Commission to make recommendations about improving preparation, training and staffing, information flows and agency integration, so that more IMTs have the capability, competence and support needed to perform well in future fires. In the lead-up to 7 February the State, including fire agencies, recognised that the day had the potential to be catastrophic and began planning and notifying the community and personnel accordingly. Pre-designated incident control centres were advised to be ready for a ‘hot start’. In practice, however, the state of readiness of the ICCs and the level 3 incident management teams that staffed them varied. Again, the State has improved its procedures since 7 February, increasing the number of personnel required for a full level 3 IMT and establishing standards for pre-positioning teams. The Commission is concerned, however, that the revised standards do not go far enough, and it proposes that in all areas where a code red fire day is forecast a full IMT be in place from 10.00 am. Additionally, fire agencies should prescribe and audit a minimum number of joint training exercises for level 3 IMTs. On 7 February not all the IMTs managing level 3 incidents were staffed by people with level 3 training, and facilities in the incident control centres from which IMTs operated were in some cases deficient. The Commission recommended in its first interim report that pre-designated level 3 ICCs be properly staffed and equipped. In response, the State allocated $28 million to upgrade level 3 ICCs and divisional command points, the upgrade being scheduled for completion by 30 June 2010. Further, the Commission’s examination of shortages of level 3 Incident Controllers revealed major differences between the DSE system of accreditation (formal assessment of a candidate against known criteria) and the CFA system of endorsement (nomination or approval of a person to perform a particular role). Since both agencies provide members to joint IMTs, it is highly desirable that there be a uniform standard and selection process, to ensure that each Incident Controller, regardless of agency, has similar experience and competence. The Commission considers that DSE’s accreditation process is rigorous and thorough and is suitable for use by both DSE and the CFA. The CFA’s process is more subjective and less transparent. The Commission proposes that a uniform, objective and transparent accreditation process for level 3 Incident Controllers and a system of performance review be adopted and that a traineeship scheme be used to progress people from level 2 to level 3 positions. Those IMTs that were poorly prepared or did not have access to fully qualified staff also often had the greatest difficulty managing information flows, which are crucial to the issuing of public warnings and informing firefighters of changing conditions and potential danger. In the light of the evidence, it is plain to the Commission that effective training is essential. The training needs to provide information on the services available at the State Control Centre—such as specialists trained in weather forecasting, fire behaviour analysis and predictive mapping—and to stress the importance of preparing timely written incident action plans (based on a standard template) within four hours of reported ignition of a fire. In addition, skilled officers need to be supported by robust, consistent and coordinated information and systems for tracking fire vehicles and mapping fires. When the State’s approach to fighting ferocious fires is so highly dependent on cross-agency coordination it is unacceptable that effective coordination of information systems has not been achieved. Finally, roadblocks play an important part in maintaining public safety during a bushfire and after a bushfire can protect health and safety or facilitate fire investigations. On and after Black Saturday more than 4,500 roadblocks were established to regulate traffic on roads leading into and around fire-affected areas. The evidence revealed a number of systemic problems with the way the roadblocks operated, among them inflexibility, poor communication and denying access to firefighters. Since Black Saturday new guidelines have been released that improve the operation of full and partial roadblocks, allow an Incident Controller to delegate responsibility for the establishment and operation of roadblocks with the support of Victoria Police, and formalise a system of wristbands to identify people who can pass through a roadblock. Guidance is also provided on how police should exercise discretion at a roadblock. The Commission welcomes the new emphasis Victoria Police gives to compassion and commonsense in the exercise of discretion. Successful response to a fire relies on an effective blend of personnel, resources and processes. On 7 February many operational systems worked well, particularly considering the weather conditions. For example, the Commission heard few complaints about firefighting equipment, which has been a priority for CFA investment in recent years. Many crews were on standby ready for initial attack, and some successfully controlled fires that were potentially very damaging. The best opportunity to bring a bushfire under control is at or near the point of ignition, when the fire is small. The role of first attack is to contain the fire swiftly and minimise the risk to life and property. This is particularly important on days of extreme fire danger, when initial attack might be the only opportunity for containing a fire. Aircraft are an integral part of initial attack and, together with ground crews, provide continuing support during an extended fire. Depending on where they are stationed and their dispatch protocols, aircraft can often get to a fire and start the initial attack before ground crews arrive. Source: Courtesy of The Herald & Weekly Times. During January–February 2009 aircraft played an important role in the responses to fires. On 7 February, however, their use and effectiveness were limited by the weather, which in many cases made flying unsafe. There were other impediments, too. For instance, the process for dispatching an aircraft requires a request for the aircraft to pass through three layers of authority before it is cleared by the State Air Desk. The system is cumbersome and in some cases delayed the air response. Alternative methods for rapid dispatch are used elsewhere in Australia and overseas, but Victorian agencies appear reluctant to consider the option of a faster response system. The Commission proposes that state policy be changed so that all personnel required to fly aircraft and support air attack are on standby on code red days and that aircraft are automatically dispatched to high-risk fires in designated areas. The Commonwealth owns and controls aircraft that could be used for firefighting. Before the 2009–10 fire season it held an operational briefing, outlining its resources and capabilities to the states and territories. The Commission considers, however, that cooperation between the State and the Commonwealth would be strengthened by an agreement that allows Commonwealth aerial resources to be automatically incorporated in the State’s preparedness planning and, where available, used on days of high fire risk. More broadly, effective access to and use of technology is important to effective detection and management of fires and tracking of resources on the ground. As noted, various problems became evident with information technology at incident control centres, including because the CFA and DSE used different systems and incident management team staff sometimes had difficulty gaining access to both systems. This inhibited the use and transfer of information such as warnings, maps and situation reports. The Commission notes that the CFA and DSE are investing in systems aimed at rectifying many of these shortcomings, including through the extensive upgrade of level 3 incident control centres. Resource tracking is often a manual and time-consuming process. It is essential Incident Controllers know the location of vehicles, personnel, equipment and aircraft so that fire management can be planned and directed and critical information, such as red flag warnings, can reach those on the fireground when they need it. The Commission identified two areas of concern. First, the CFA and DSE use different systems and the CFA system, by the CFA’s own admission, has not kept up with emerging technology. Second, on 7 February there were widespread problems with radios and phones and crews not filling in the required paperwork, which made it difficult to track firefighters and vehicles. The Commission makes specific suggestions for improving information and tracking systems and proposes that standardising these systems be a priority. Communications systems on 7 February were also hindered by poor coverage, lack of interoperability between emergency services agencies, and insufficient investment in new technologies. For example, the transmission speed of the paging system had been reduced in order to expand reception coverage, and this caused serious delays in other than the most urgent messaging. There were also communication difficulties between metropolitan and regional police because of incompatible radio systems. Further, radio ‘black spots’ meant that reception was poor or non-existent in some areas, and there was channel congestion and insufficient channel availability. These problems were exacerbated when fire damaged or destroyed radio and telecommunications infrastructure. The State has begun work to resolve these problems, notably through the new Emergency Services Communications Strategic Framework, which has six priorities: seamless statewide communication, call taking and dispatch, consistent statewide quality of service, improved data services, location-based services, and community communication. Until the statewide communications system envisaged by the new framework becomes a reality, the CFA should continue to improve its existing communications system, including by resolving coverage deficiencies. There should also be further research into smoke interference with communications systems and equipment, and this problem should be recognised in CFA and DSE training for communications planners. The CFA’s and DSE’s management of firefighter safety deserves commendation. The number of fires that needed to be tackled simultaneously, and their intensity, created enormous challenges and risks for firefighters on Black Saturday. At times conditions were chaotic on the fireground, communications were difficult, and supervisors and crew leaders were required to manage in extreme conditions. The fact that there were no firefighter deaths during firefighting activities on 7 February speaks volumes for the emphasis the CFA and DSE had given to training and safety awareness. Improving firefighter safety is a focus for the CFA and DSE, especially since the Linton inquiry into the death of five firefighters in 1998. In the days before 7 February there was a strong emphasis on firefighter safety, including giving crews safety briefings. A number of crews praised the equipment and safety measures available to them during the burnovers on Black Saturday. Despite this, the Commission heard that there is further scope to improve firefighter safety. Although no-one died during firefighting activities, regrettably two firefighters did die in February 2009. One firefighter died on 7 February when he left his crew to help a relative, and an interstate firefighter died on 17 February after being struck by a falling tree. There were also numerous occasions on which firefighters were in extreme danger and some were injured. Firefighters caught in burnovers often lacked the accurate and timely information they needed to avoid risk. Inadequate briefings, communication and communication equipment, maps and weather information were common concerns. The Commission also identified several deficiencies in safety investigations and proposes that the CFA and DSE amend their procedures for investigating safety incidents and ‘near misses’. Fire agencies should also focus on ensuring that they have thorough processes for identifying and approving particularly dangerous activities such as back-burns. The Commission recommends that this be supported by training for all personnel, to ensure there is a clear understanding of the responsibility of the Incident Controller in approving such activities. The Commission is also disappointed at the low priority given to the appointment of safety advisers, despite such advisers being mandatory for level 3 incidents under the CFA and DSE joint standard operating procedures. These personnel ensure that safety is a priority and advise, guide and support the incident management team in identifying and dealing with safety concerns. On 7 February there were about 200 trained DSE and CFA safety advisers but only two were appointed to incident management teams. Given the failure to appoint safety advisers and the dangerous situations that caught a number of firefighters unaware on 7 February, the Commission reaffirms that an officer responsible for safety must be appointed to all level 3 incidents. In addition, safety advisers should be renamed safety officers—consistent with recommendations from the Linton inquiry and consistent with the title given to other key personnel in an incident management team. It is axiomatic that the most effective way of reducing bushfire damage and protecting human life is to prevent fires from starting. It is obviously impossible to eliminate bushfires, but it is possible to reduce the risk and incidence of fires started as a result of human activity. Nine of the 15 fires the Commission examined were started as a direct or indirect result of human activity; five were associated with the failure of electricity assets, and the causes of four were thought to be suspicious. Broader data suggest that about one-third of bushfires in Victoria might be lit by people acting with mischievous or criminal intent. Although the proportion of fires that are caused by electricity infrastructure is low—possibly about 1.5 per cent of all ignitions in normal circumstances—on days of extreme fire danger the percentage of fires linked to electrical assets rises dramatically. Thus, electricity-caused fires are most likely to occur when the risk of a fire getting out of control and having deadly consequences is greatest. Victoria’s electricity assets are ageing, and the age of the assets contributed to three of the electricity-caused fires on 7 February 2009—the Kilmore East, Coleraine and Horsham fires. Distribution businesses’ capacity to respond to an ageing network is, however, constrained by the electricity industry’s economic regulatory regime. The regime favours the status quo and makes it difficult to bring about substantial reform. As components of the distribution network age and approach the end of their engineering life, there will probably be an increase in the number of fires resulting from asset failures unless urgent preventive steps are taken. The Commission considers that now is the time to start replacing the ageing electricity infrastructure and to make major changes to its operation and management. The seriousness of the risk and the need to protect human life are imperatives Victorians cannot ignore. The number of fire starts involving electricity assets remains unacceptably high—at more than 200 a year. Although it is not possible to eliminate the risk posed by electricity assets, the State and the distribution businesses should take the opportunity to invest in improved infrastructure and substantially remove one of the primary causes of catastrophic fires in Victoria during the past 40 years. In view of the size of Victoria’s electricity distribution network, any replacement program will take years to complete even if it begins immediately. It is therefore necessary to consider interim measures for reducing the bushfire risk associated with the current network and the Commission suggests ways by which this could be done. The Commission considers that Energy Safe Victoria needs to take a more proactive role as the electricity industry safety regulator. In the past it has taken a largely passive role, focusing on confirming distribution businesses’ bushfire mitigation plans and line clearance plans. It has not assessed in detail whether safety objectives contained in the Electricity Safety Act 1998 are actually being achieved. The Electricity Safety Management Scheme regime has undergone important changes recently. It is now compulsory for the distribution businesses to participate in the regime and specify how they will meet their obligations under the Electricity Safety Act. Energy Safe Victoria should now also have access to more of the data needed to assess the circumstances of fires caused by failed distribution infrastructure and ‘near misses’, so that it can identify trends and take these into account in the development of bushfire prevention strategies. Overall, the Commission is strongly of the view that Energy Safe Victoria’s regulatory powers and resources need to be strengthened, including the organisation’s ability to apply sanctions for non-performance. It proposes that Energy Safe Victoria have a clear mandate to prevent and mitigate electricity-caused bushfires and powers to fulfil that mandate. The other major bushfire cause linked to human activity relates to fires that people deliberately or accidently light. Deliberate fire-setters constitute only a small proportion of the population, yet their actions can cause enormous damage to individuals, communities and the environment. The evidence before the Commission suggests that there is a good deal of preventive activity under way at the local, state and national levels. There remains, however, considerable scope to improve the evidence base on deliberate fire-setting and so improve policy and program development; the extent and causes of this behaviour are not well understood. The Commission notes that traditionally Victoria Police’s approach to arson has focused on criminal investigation and emergency management, rather than crime prevention. This appears to be changing. Victoria Police has acknowledged that it is necessary to better understand arsonists and their behaviour and motivations in order to improve prevention and control. It advised the Commission that since 7 February 2009 it has greatly increased the attention it pays to arson prevention. Specifically, it has introduced a statewide arson prevention and detection strategy and a statewide Operations Response Unit, which will, among other things, increase visible police patrols in high-risk locations during periods of extreme bushfire risk. The Commission welcomes the focus on research and evaluation of current and proposed strategies. It urges Victoria Police to continue to pursue a coordinated statewide approach to arson prevention and to evaluate this approach after the first fire season in which it operates, to determine whether sufficient support is being given to local initiatives. The Commission also welcomes the national focus on arson prevention by the Ministerial Council for Police and Emergency Management. It encourages the Commonwealth, state and territory governments to ensure that the National Work Plan to Reduce Bushfire Arson has a suitable focus on evaluating current and proposed programs to encourage the development and sharing of best-practice approaches and gives priority to producing a nationally agreed framework for data collection. Fire is an integral part of the Australian environment, and the states in the south-east are most prone to bushfires. The risks associated with bushfires are also potentially increasing as a result of population growth in the rural–urban interface and the probable effects of climate change. The result is that, although it might be possible to reduce the number of severe fires and to be better prepared for fire, bushfire will never be eliminated from the Australian landscape. Recognising that it is not possible to stop all fires, the Commission considered ways of reducing the loss of life and damage caused when fire does occur by reducing exposure to fire, helping to make homes more defendable, reducing the intensity and spread of fire, and helping people recover from the impact of fire. In all, 2,133 houses were destroyed as a result of the January–February 2009 bushfires in Victoria. The Commission heard many accounts of people who tried to defend a well-prepared house and failed. Many of the 173 people who died as a result of the fires had been trying to defend their home, a number of which had been prepared in accordance with CFA advice. These results demonstrate that where people live, the standard of the buildings in which they live, how those standards are maintained and, therefore, planning and building controls are crucial factors affecting safety in a bushfire. The protection of human life should always be the overriding objective. Although it is not possible to guarantee that any building will survive a bushfire, particularly a ferocious one, the Commission considers that there are some areas where the bushfire risk is so high that development should be restricted. Source: David Geraghty, courtesy of The Herald & Weekly Times. The approach the Commission proposes acknowledges the complexity of the planning system and seeks to strengthen consideration of bushfire throughout the planning process by giving greater recognition to bushfire risk without imposing unacceptable biodiversity costs. This is the most effective way of maintaining the capacity to assess each development on its merits, while ensuring that such assessment attaches sufficient weight to the risk and impacts of bushfire. The Commission therefore proposes that the Victoria Planning Provisions relating to bushfire and the CFA guidelines for assessing permit applications in areas of high bushfire risk be amended in order to give priority to protecting human life and to ensure that development does not occur in areas in which either the bushfire risk or the environmental cost of making people safe is too high. The effectiveness of these controls should be reviewed at a later stage to determine whether the objective of substantially limiting the construction of homes in areas of high bushfire risk has been achieved. If not, more prescriptive controls should be introduced. In addition, the Commission makes detailed proposals about the planning regime in order to improve information and understanding of bushfire through better mapping of both bushfire risk and Victoria’s biodiversity. It also recommends that bushfire risk be accounted for in the application of controls on clearing native vegetation and that the construction of houses be restricted on high-risk blocks that are too small to enable a defendable space to be created and maintained. In relation to building standards, the Commission concludes that construction standards for bushfire-prone areas do not adequately cover all the important components of bushfire risk. It recommends improving standards and clarifying objectives to redress these deficiencies. The high risk to any home that is built in the Flame Zone and is therefore likely to be subject to direct contact with flames must also be recognised. Deemed-to-satisfy construction standards are not appropriate for such dwellings. Because of the risk, each building must be designed specifically to respond to the conditions on the site. Further, building regulations do not adequately cover the construction of non-residential buildings used by vulnerable groups—for example, schools, hospitals, child care centres and aged care facilities—in bushfire-prone areas. The building regulations need to contain specific standards for the construction of such buildings. Applying land-use planning and building controls to minimise or reduce bushfire risk presents challenges. In particular, the planning and building systems operate prospectively and have little capacity to deal with past decisions and existing settlements or buildings in bushfire-prone areas, so they cannot account for people who are already living in areas of extremely high risk. The Commission therefore proposes that action be taken to help people move away from those areas where other bushfire risk-mitigation measures are not viable. In particular, the State should develop and implement a voluntary retreat and resettlement strategy—including non-compulsory land acquisition—for existing developments in areas at unacceptably high bushfire risk. Even when bushfire safety is embedded in planning and building decisions it can be difficult to ensure that the standards that applied at the time of subdivision or construction are maintained. There is a need for mechanisms designed to ensure that bushfire safety continues to be a priority for building owners. The Commission puts forward a range of proposals aimed at facilitating continued maintenance of standards—including amending the Sale of Land Act 1962 to require that vendor statements include information that will help potential buyers understand the bushfire risk of a property before they finalise the purchase. Prescribed burning is one of the main tools for fire management on public land. It cannot prevent bushfire, but it decreases fuel loads and so reduces the spread and intensity of bushfires. By reducing the spread and intensity of bushfires, it also helps protect flora and fauna. Ironically, maintaining pristine forests untouched by fuel reduction can predispose those forests to greater destruction in the event of a bushfire. About 7.7 million hectares of public land in Victoria is managed by DSE. This area includes national parks, state forests and reserves, of which a large portion is forested and prone to bushfire. DSE burns only 1.7 per cent (or 130,000 hectares) of this public land each year. This is well below the amount experts and previous inquiries have suggested is needed to reduce bushfire and environmental risks in the long term. The Commission recognises that prescribed burning is risky, resource intensive, available only in limited time frames, and can temporarily have adverse effects on local communities (for example, reduced air quality). Nonetheless, it considers that the amount of prescribed burning occurring in Victoria is inadequate. It is concerned that the State has maintained a minimalist approach to prescribed burning despite recent official or independent reports and inquiries, all of which have recommended increasing the prescribed-burning program. The State has allowed the forests to continue accumulating excessive fuel loads, adding to the likelihood of more intense bushfires and thereby placing firefighters and communities at greater risk. The Commission proposes that the State make a commitment to fund a long-term program of prescribed burning, with an annual rolling target of a minimum of 5 per cent of public land each year, and that the State be held accountable for meeting this target. DSE should modify its Code of Practice for Fire Management on Public Land so that it is clear that protecting human life is given highest priority, and should report annually on prescribed-burning outcomes. To ensure continuing environmental protection, the State needs to improve its understanding of the effects of different fire regimes on flora and fauna. The Commission proposes that DSE expand its data collection on the effects of prescribed burning and bushfire on biodiversity. Maintenance and extension of data collection on Victoria’s flora and fauna assets has not been a high priority. It needs to be improved so that more informed and scientifically-based decision making can accompany the development of prescribed-burning regimes that meet conservation objectives as well as accommodating bushfire safety considerations. Managing clearing along roadsides is a particular challenge for municipal councils. The councils are responsible for bushfire prevention and mitigation and biodiversity management along local and some arterial roads; VicRoads has similar responsibilities for rural freeways and arterial roads. In some cases these roadsides contain the only remnant native vegetation in an area and offer important wildlife corridors and shelter. Consequently, differing objectives for road safety, biodiversity protection and bushfire prevention can be difficult to reconcile. In the case of bushfires, roads and roadsides can be important fuel breaks, so road managers need to reduce the fuel levels in preparation for the fire season. Roads are also essential for people seeking to escape fires and for emergency services seeking access to fires. Since the 2009 fires land and road managers and the CFA have identified high-risk roads and are carrying out fuel-reduction work to reduce the future risks of bushfire. The Commission is aware of the unresolved tensions between mitigation of bushfire risk and environmental conservation in the approach to roadside clearing and the legislative complexities to do with road safety, biodiversity and bushfire risk mitigation that affect roadside management. These concerns would be reduced if the State’s planning provisions were amended to facilitate a broad range of roadside works to reduce bushfire risk, if municipal councils received better guidance to help them resolve competing environmental and bushfire management objectives, and if VicRoads implemented a systematic statewide assessment of bushfire risk for all roads. The destruction wrought by the bushfires of January–February 2009 resulted in one of the largest recovery efforts seen in Australia. The Commission’s observations on the early relief and recovery efforts are based on accounts of people’s individual experiences and information it examined. Recovery for people, communities, local economies and the environment is difficult and requires a long-term approach. This process is being facilitated by the Victorian Bushfire Reconstruction and Recovery Authority, established on 10 February 2009. In view of the scale of the disaster, the Commission considers that overall the initial relief and recovery efforts were well managed. Municipal council relief centres were generally activated quickly. They provided assembly points and places of refuge for people displaced by the fires and helped to lay a foundation for the progressive build-up of relief and recovery services. The Commission heard many expressions of gratitude from people affected by the bushfires for the care and attention they received at relief centres. The State and Commonwealth Governments’ relief initiatives were generally prompt and well coordinated. The Minister for Police and Emergency Services coordinated recovery efforts at the State Cabinet level, as would be expected. People from local communities, and then the wider community, responded generously to the obvious need for support to be provided to people rendered homeless and dislocated by the fires. Food, clothing and bedding flooded in to relief centres, and a great debt of gratitude is owed for this generosity. 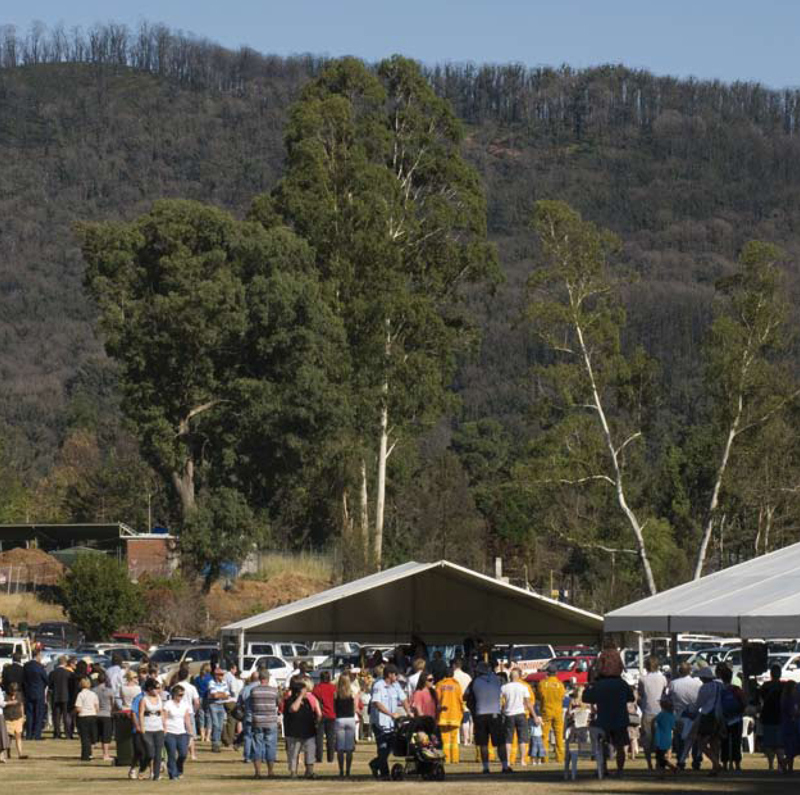 • The registration process in relief centres was frustrating to many as recovery agencies separately collected personal information from bushfire-affected people, adding to their trauma and slowing the agencies’ ability to respond. It took some time for coordinated collection of information to become effective. • Medical services were not always available locally, and initially there appeared to be poor coordination of some first aid services. 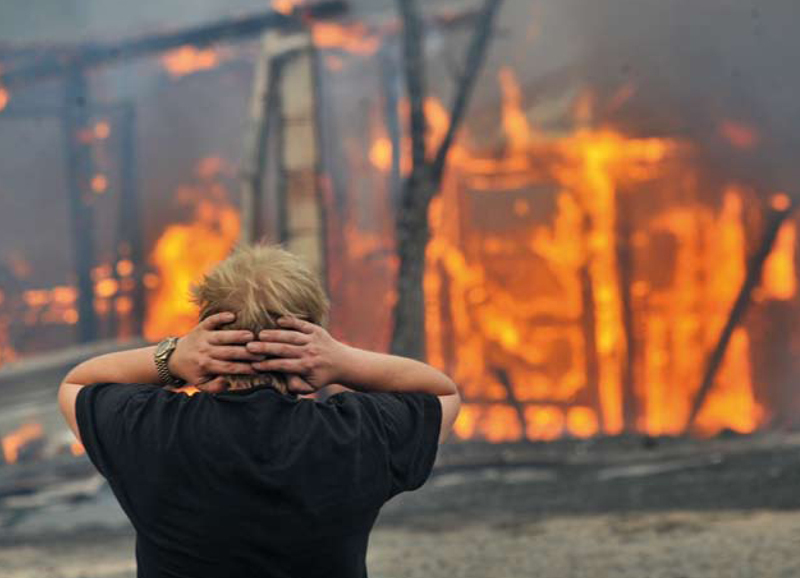 • Post-fire welfare checks were not well coordinated, especially for small, isolated communities and individuals who remained on their properties. • Roadblocks were a source of frustration and difficulty for local residents, Victoria Police, the Department of Primary Industries, CFA volunteers and others coordinating relief efforts. Source: Courtesy of The Age. • Non-insurance and under-insurance have impeded the rebuilding process. • Fencing bordering public land remains a problem because of the requirement that private landowners bear the full cost of restoring damaged fencing between their property and public land. • The coordination of animal relief after the fires was fragmented. The State has since initiated changes to improve many of these processes. The Commission considers it too early to comment in detail on the medium- to long-term recovery and reconstruction effort, but it encourages the review and evaluation of initiatives to support learning from experience. Although there is much to learn from the experiences of Black Saturday, the Commission urges all involved in developing and implementing bushfire policy to look to the long term. Governments need to create an environment in which individuals, communities and fire agencies build on current knowledge in the light of future information and experience. To make people living in bushfire-prone areas safer, Victoria needs flexible policy that takes advantage of new technology and changes management practices to capitalise on potential improvements. Adaptive thinking and processes are best supported by good organisational structures, rigorous research, and continuous policy evaluation and improvement. In the Commission’s view, a disaster of the scale of 7 February will always put pressure on organisational processes and structures. In this case it highlighted serious deficiencies in top-level leadership as a result of divided responsibilities, and the operational response was hindered by differences between agencies’ systems, processes and procedures. Individually, the problems identified might be resolved by changing working arrangements between the CFA and DSE, and work is already under way towards this. But, when considered collectively, the problems illustrate systemic failings that led the Commission to contemplate organisational change. The Commission does not consider that the shortcomings identified in connection with Black Saturday can be overcome simply by doing more of the same, even if it is done better. Many of the concerns identified related to operational matters such as control, interoperability and interagency standards, leading the Commission to conclude that a focus on improving operational capability is required. In considering the role of organisational change in responding to these concerns the Commission sought a wide range of views from within Victoria, from interstate and overseas, and from the policy, operational and academic perspectives. A diversity of views was presented. There was no consensus about the best approach to organisational arrangements for Victoria’s fire services agencies. Nor was a compelling model put forward. In weighing the various opinions, the Commission was not convinced by the State’s view that structural change is not needed and that the focus should be on refinement of existing arrangements. For many of the operational problems the Commission identified, previous attempts to improve coordination have failed. Typically, progress has been slow or incomplete or has not achieved the level of interoperability required. Neither is the Commission persuaded that radical reform, such as moving to a single fire service, is necessary or desirable at this time. There might be an intuitive attraction to merging agencies, but there is a risk that the merger itself becomes the primary focus of effort, which could easily distract attention and focus from the operational improvements the Commission considers to be the priority. Further, if it were not done carefully, subsuming all elements into one agency could undermine the strengths of each agency. For instance, DSE’s specialist expertise in forest firefighting—which is crucial given the fire risk that characterises Victoria’s forests—must be maintained and strengthened. Additionally, there were no compelling criticisms of the governance structures of the fire agencies, and the Commission therefore proposes that the existing governance arrangements remain unchanged. The absolute priority is to improve operational performance. In support of this, the Commission recommends modest and targeted organisational reform as a catalyst for change. This would involve improvements to common operational policy and standards, stronger coordination and unambiguous command and control, greater interoperability, and a strengthened capacity to provide an integrated response. • representing Victoria on operational matters in national committees. The Commission also looked at the funding of fire services. Fire services in Victoria are currently funded through a mix of contributions from insurance companies, the State and municipal councils. Insurance companies recoup the cost of their statutory contribution to the CFA and the MFB by imposing a Fire Services Levy on insurance premiums for building and contents insurance. The current model’s claimed benefit is that the insurance premium is a good way of linking the charge for fire services to the fire risk of individual properties. Evidence suggests, however, that this link is at best tenuous. Fundamentally, the Commission considers that the current funding model lacks transparency and is inequitable since people who are not insured or are under-insured do not make a fair contribution to the funding of fire services. The Commission takes the view that the lack of equity and transparency in the current arrangements constitutes a good reason for moving to another system. Several other Australian states and territories already require all property owners to contribute to fire services via a levy on property, as opposed to insurance, and the Commission proposes that Victoria also move to replace the Fire Services Levy with a property-based levy. Governments need to invest more in bushfire research to enable Australia to rebuild the capacity it once had as a leader in this field. The Bushfire Cooperative Research Centre (initiated by Australian and New Zealand fire and land management agencies, their research partners and the Commonwealth Government) contributes to this effort. Overall, the Bushfire CRC has made gains in re-establishing a community of researchers and has consolidated the research agenda, but it does not meet all research needs. To a large extent its research program is determined by its stakeholders (which has resulted in a focus on applied research) and its funding cycle and thus its research projects have been relatively short term. Commonwealth Government funding for the Bushfire CRC is due to expire in 2013. • the research priorities highlighted in evidence before the Commission. • the shelter options—including factors affecting the safety of different places of shelter and particularly motor vehicles in the open, dams, pools, creeks and water tanks. In addition to this, the Commission invites the Commonwealth to take the initiative on two matters outside the proposed research framework. The first is to consider the development of nationally acceptable bushfire terminology. It became apparent during the Commission’s hearings that a number of bushfire-related terms are cumbersome, have obscure meanings or are potentially confusing to the general public. The second matter arises from there being no agreed methodology for estimating the cost of bushfires. The Commission experienced difficulty performing its analysis because of the lack of data and the absence of an agreed methodology for estimating various costs. This is a deficiency in the nationally available bushfire information and an area in which further collaborative work is warranted. Finally, if fire agencies are to lift their capability and performance and improve the response capacity of individuals and communities, they need to become true evidence-based learning organisations. The Commission proposes that the fire agencies adopt and fund a culture of reflective practice that routinely pursues current research, searches for best practice, and habitually evaluates policies, programs and procedures with a view to improving internal practice and that of the communities they serve. Policy—especially in an area such as bushfire safety—needs to be reviewed and evaluated periodically, with the results of such review and evaluation being used in the development of policy and program improvements. In response to the unprecedented events of Black Saturday, the State, the Commonwealth and local governments made changes to their policies and practices. The governments and agencies initiated some of these changes of their own volition; other changes were implemented in response to the recommendations in the Commission’s interim reports. Since the Commission’s interim reports were issued the State has invested a considerable amount in infrastructure, technological improvements and wide-ranging amendments to policies and procedures. For example, it endorsed a 10-year Emergency Services Communications Strategy Framework to improve emergency services communications and developed the One Source One Message tool to enable all Incident Controllers to send bushfire warnings simultaneously to a range of outlets, including the CFA and DSE websites, Victorian Bushfire Information Line operators and media broadcasters. Although the State has shown a strong commitment to implementing the Commission’s recommendations, the Implementation Monitor nevertheless noted some concern about the recommendations relating to the fire danger rating, ‘neighbourhood safer places’, and the preparedness of some incident control centres. The Implementation Monitor also noted slow progress in the local government sector. The Commonwealth has also made progress implementing initiatives and the Commission’s interim recommendations. Among the important developments are provision of funding to the states and territories for the procurement of the national telephone-based warning system, incorporating fire danger indexes in district and township forecasts issued by the Bureau of Meteorology, and moving speedily to initiate the development of standards for bunkers in bushfire-prone areas. As this final report makes further recommendations, the implementation effort will be ongoing. The Commission notes that the recommendations of previous inquiries have not always been implemented. For example, recommendations recognising the importance of prescribed burning in managing bushfire risk have not led to suitable prescribed-burning targets for Victoria. The Commission therefore considers that there is a need for a process whereby governments and the community have access to transparent, independently verified information on the response to the Commission’s recommendations. The State should nominate an independent implementation monitor or the Victorian Auditor-General to provide to the people of Victoria a report within two years on implementation of the Commission’s recommendations. The report should detail the progress made towards implementing each recommendation in the final report and the interim reports. Recommendations from the interim reports that have not been fully implemented (such as those concerning refuges) should be given specific focus. Other recommendations that should receive particular attention are those that governments have previously shown reluctance to implement (such as increased fuel-reduction targets) and major recommendations that will require substantial implementation effort (such as replacing ageing electricity distribution infrastructure). Where appropriate, the annual reports of government and fire agencies should detail the outcomes and effectiveness of the response to the recommendations. If there is no discernible change, more extensive reform might be needed. Implementation of the Commission’s recommendations calls for effort on the part of all levels of government. This might prove particularly challenging for municipal councils. The Commission envisages that councils would take a much greater role in local planning and preparation for bushfire and in implementing existing planning and building laws within a framework that takes better account of bushfire risk, while continuing with their existing role in bushfire relief and recovery. The Commission makes some suggestions that would also help to clarify processes for municipal councils in areas such as clearing roadside vegetation, but it is also sensitive to the imbalance in the financial capacity of various municipal councils and the difficulty they have obtaining technical expertise in relation to bushfire. In a perverse way, those councils that have the most pressing need to apply substantial resources and effort to make their communities more bushfire safe are in many cases those that are the least well resourced. The State should examine whether local government requires greater support, including funding, to ensure that individual councils have the capacity to implement the agreed changes. The Commission produced two interim reports and a final report. The interim reports form part of the work and deliberations of the Commission and, along with the final report, should be regarded as one body of work. • Volume IV—The Statements of Lay Witnesses. The conclusions from Volumes I and II are outlined in this summary. Volume III describes the work of the Commission, the conduct of its inquiry, and its administration for the Victorian historical and public record. It will be useful for others who in future are faced with the task of establishing and running a royal commission. In reflecting on lessons learnt from this Royal Commission, the Commission notes that, unlike other state jurisdictions or the Commonwealth, Victoria does not have specific legislation that deals with the role, conduct and powers of a commission of inquiry. This lack of a legislative basis caused uncertainty, which the Commission considers undesirable. Arising from this, the Commission proposes that the State consider legislation for the conduct of inquiries—in particular, the conduct of royal commissions. Volume IV is an electronic volume that collates the statements of the 100 lay witnesses who shared their experience of the fires during the Commission’s hearings. The lay witnesses were an important part of the Commission’s work, giving an ‘on the ground’ perspective to the experiences and real-life examples of how fire policies and emergency procedures affect individuals and communities. This offers an important way of preserving personal memories of the fires. It provides insights into people’s preparation for bushfire and how they reacted to the conditions of Black Saturday and serves as a powerful reminder of the impacts of the fires on individuals, families and communities. Volume IV appears in electronic form only because, as well as containing written statements, it contains photographs, video footage, other documentary material provided as part of the evidence, maps, and satellite photographs taken before and after the fires to help illustrate the impact the fires had on different parts of the state. The quantity and nature of the material mean a printed version is impractical. The State is responsible for making copies of the Commission’s report available to the public and will be doing so through Information Victoria. The report is available in hard copy and electronically. The electronic version is available on DVD and via the internet; it contains hyperlinks that enable the reader to also read the evidence referred to in the report. For the next 12 months the electronic version of the report and other information about the Commission will be retained on the Commission’s website, www.royalcommission.vic.gov.au. After that it will be available through the website of the Victorian Department of Premier and Cabinet. In preparing its recommendations the Commission chose not to constrain the State with undue prescription: it wanted to obviate the risk of narrowing policy makers’ vision. To complement the recommendations, the Commission expresses views and draws conclusions in the text of the report, proposing the type of action the State (and others) should take to deal with matters that warrant further attention. The Commission trusts that those responding to the report will attach substantially the same weight to these proposals as they accord the primary recommendations. When the term ‘State’ is used in the recommendations it is not intended to be read narrowly. It applies not just to the elected government and the organisations that form part of the Victorian public service. Depending on the circumstances, it can also encompass public entities that make up the broader public sector, such as the Country Fire Authority, and the ‘special bodies’ defined in the Public Administration Act 2004, such as Victoria Police. • improve advice on the nature of fire and house defendability, taking account of broader landscape risks. • regularly evaluate the effectiveness of community education programs and amend them as necessary. • compile and maintain a list of vulnerable residents who need tailored advice of a recommendation to evacuate and provide this list to local police and anyone else with pre-arranged responsibility for helping vulnerable residents evacuate. • acknowledging personal shelters around their homes as a fallback option for individuals. Victoria lead an initiative of the Ministerial Council for Education, Early Childhood Development and Youth Affairs to ensure that the national curriculum incorporates the history of bushfire in Australia and that existing curriculum areas such as geography, science and environmental studies include elements of bushfire education. The Commonwealth lead an initiative through the Ministerial Council for Police and Emergency Management, facilitated by Emergency Management Australia, to develop a national bushfire awareness campaign. • that a full level 3 IMT be led by a level 3 Incident Controller unless the State Controller determines otherwise. The Country Fire Authority and the Department of Sustainability and Environment prescribe and audit the minimum number and nature of level 3 joint training exercises in which incident management team staff (including volunteers) are required to participate. The State clarify whether, during major fires, Victoria Police should discharge its coordination functions from the State Emergency Response Coordination Centre or from the State Control Centre. • designate the Chief Commissioner of Police as Coordinator in Chief of Emergency Management, who would have primary responsibility for keeping the Minister informed during an emergency. The State consider either amending the Emergency Management Act 1986 or adopting a standing practice to require the Minister for Police and Emergency Services or the Chief Commissioner of Police to consult the Premier about the possibility of declaring a state of disaster for all of or any part of Victoria whenever the Minister or the Chief Commissioner of Police becomes aware of circumstances that make it a reasonable possibility that the criteria for making such a declaration will be satisfied. The State consider amending the Emergency Management Act 1986 to introduce a graded scale of emergency declarations short of a state of disaster. • ensure that an individual with local knowledge is incorporated in an incident management team. • provide regular training to IMT staff, highlighting the importance of information and reinforcing the support available from specialists within the State Control Centre. • requiring before the 2010–11 fire season that FireMap be used for joint incidents. • a traineeship program for progression from level 2 to level 3 incident management team positions. The Country Fire Authority and the Department of Sustainability and Environment amend their procedures to require that a suitably experienced, qualified and competent person be appointed as Incident Controller, regardless of the control agency for the fire. The Country Fire Authority provide to all CFA volunteers an identification card or similar to facilitate their passage through roadblocks established in accordance with the 2009 Guidelines for the Operation of Traffic Management Points during Wildfires. • establish a system that enables the dispatch of aircraft to fires in high-risk areas without requiring a request from an Incident Controller or the State Duty Officer. The State, in conjunction with Emergency Management Australia and the Department of Defence, develop an agreement that allows Commonwealth aerial resources that are suitable for firefighting and support activities to be incorporated in preparedness plans and used on days of high fire risk. The Country Fire Authority and the Department of Sustainability and Environment standardise their operating systems and information and communications technologies with the aim of achieving greater efficiency and interoperability between agencies. The Country Fire Authority review and improve its communications strategy as a matter of priority and develop a program for identifying and responding to black spots in radio coverage. The Country Fire Authority and the Department of Sustainability and Environment amend their procedures for investigating safety incidents and ‘near-misses’ to ensure that all dangerous incidents, including back-burns, are fully investigated and that all relevant people are consulted and informed of the results. The Country Fire Authority and the Department of Sustainability and Environment require without exception that all relevant staff be trained in the need for Incident Controller approval to be obtained before a back-burn is lit. The Country Fire Authority and the Department of Sustainability and Environment adopt the title ‘safety officer’ (as opposed to ‘safety adviser’) and require without exception that a safety officer be appointed to every level 3 incident management team. • the progressive replacement of all 22-kilovolt distribution feeders with aerial bundled cable, underground cabling or other technology that delivers greatly reduced bushfire risk as the feeders reach the end of their engineering lives. Priority should be given to distribution feeders in the areas of highest bushfire risk. The State (through Energy Safe Victoria) require distribution businesses to change their asset inspection standards and procedures to require that all SWER lines and all 22-kilovolt feeders in areas of high bushfire risk are inspected at least every three years. The State (through Energy Safe Victoria) require distribution businesses to review and modify their current practices, standards and procedures for the training and auditing of asset inspectors to ensure that registered training organisations provide adequate theoretical and practical training for asset inspectors. The State amend the regulatory framework for electricity safety to require that distribution businesses adopt, as part of their management plans, measures to reduce the risks posed by hazard trees—that is, trees that are outside the clearance zone but that could come into contact with an electric power line having regard to foreseeable local conditions. • adjust the reclose function on the automatic circuit reclosers on all 22-kilovolt feeders on all total fire ban days to permit only one reclose attempt before lockout. • fit or retrofit all spans that are more than 300 metres long with vibration dampers as soon as is reasonably practicable. The State amend the regulatory framework for electricity safety to strengthen Energy Safe Victoria’s mandate in relation to the prevention and mitigation of electricity-caused bushfires and to require it to fulfil that mandate. • a requirement that all fire-prone police service areas have arson prevention plans and programs, according to their level of risk. • finalise the alignment of site-assessment methods for planning and building purposes, taking into account bushfire risk to human safety as well as to property. 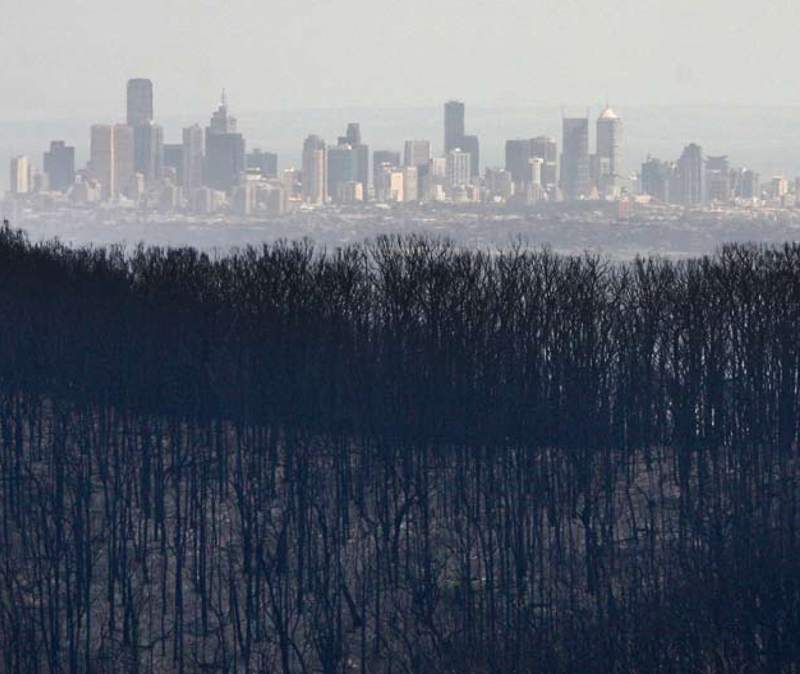 • includes a process for responding to bushfire risk at the planning stage for new urban developments in regional cities, the process being similar to that used for new developments in Melbourne’s Urban Growth Zone. • amend clause 44.06 of the Victoria Planning Provisions to provide a comprehensive Bushfire-prone Overlay provision. • emphasise the need for enduring permit conditions—in particular, conditions for the creation and maintenance of minimum defendable space to be maintained for the life of the development. • develop guidelines for determining the maximum level of native vegetation removal for bushfire risk mitigation, beyond which level the application would be rejected. The Department of Sustainability and Environment develop and administer a collective offset solution for individual landholders who are permitted to remove native vegetation for the purpose of fire protection. The Department of Sustainability and Environment conduct biodiversity mapping identifying flora, fauna and any threatened species throughout Victoria and make the results publicly available. The format used should be compatible with that used for Bushfire-prone Area mapping. The Country Fire Authority produce for community guidance material on fire-resistant landscape and garden design, including a list of fire-resistant species. The State press municipal councils—in particular, Murrindindi Shire Council—to urgently adopt a bushfire policy in their Local Planning Policy Framework and incorporate bushfire risk management in their planning policies and strategies for rebuilding communities such as Marysville, Kinglake and others affected by the January–February 2009 fires. The State develop and implement a retreat and resettlement strategy for existing developments in areas of unacceptably high bushfire risk, including a scheme for non-compulsory acquisition by the State of land in these areas. • review, and amend as appropriate, the testing methods prescribed in its standards for Tests on Elements of Construction for Buildings Exposed to Simulated Bushfire Attack (AS 1530.8.1 and AS 1530.8.2) to ensure that, so far as is possible, the methods provide a reliable predictor of the performance of construction elements under bushfire conditions. • include in the Building Code of Australia bushfire construction provisions for non-residential buildings that will be occupied by people who are particularly vulnerable to bushfire attack, such as schools, child care centres, hospitals and aged care facilities. • other than in exceptional circumstances, to apply a minimum AS 3959-2009 construction level of BAL-12.5 to all new buildings and extensions in bushfire-prone areas. Standards Australia move expeditiously to develop a standard for bushfire sprinklers and sprayers. The Victorian Building Commission, in conjunction with the Country Fire Authority, develop, publish and provide to the community and industry information about ways in which existing buildings in bushfire-prone areas can be modified to incorporate bushfire safety measures. The State develop and implement, in consultation with local government, a mechanism for sign-off by municipal councils of any permit conditions imposed under the Bushfire-prone Overlay and the regular assessment of landowners’ compliance with conditions. 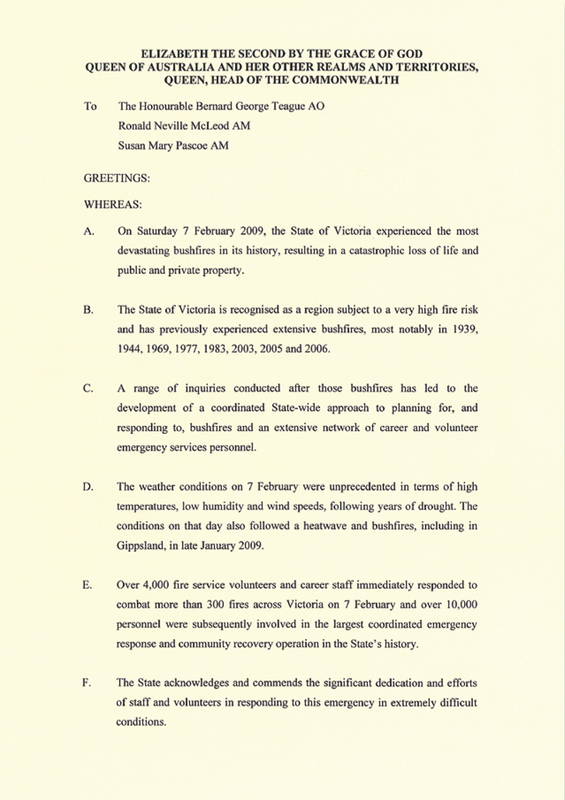 The State amend s. 32 of the Sale of Land Act 1962 to require that a vendor’s statement include whether the land is in a designated Bushfire-prone Area, a statement about the standard (if any) to which the dwelling was constructed, the bushfire attack level assessment at the time of construction (where relevant) and a current bushfire attack level assessment of the site of the dwelling. The State amend the Country Fire Authority Act 1958 to enable the Chief Officer to delegate the power to issue fire prevention notices. • helping a suitable tertiary institution design and implement a course on bushfire planning and design in Victoria. The Department of Sustainability and Environment report annually on prescribed burning outcomes in a manner that meets public accountability objectives, including publishing details of targets, area burnt, funds expended on the program, and impacts on biodiversity. The Department of Sustainability and Environment significantly upgrade its program of long-term data collection to monitor and model the effects of its prescribed burning programs and of bushfires on biodiversity in Victoria. • adopt the use of the term ‘bushfire’ rather than ‘wildfire’. The State amend the exemptions in clause 52.17-6 of the Victoria Planning Provisions to ensure that the provisions allow for a broad range of roadside works capable of reducing fire risk and provide specifically for a new exemption where the purpose of the works is to reduce bushfire risk. The State and Commonwealth provide for municipal councils adequate guidance on resolving the competing tensions arising from the legislation affecting roadside clearing and, where necessary, amend environment protection legislation to facilitate annual bushfire-prevention activities by the appropriate agencies. VicRoads implement a systematic statewide program of bushfire risk assessment for all roads for which it is responsible, to ensure conformity with the obligations in s. 43 of the Country Fire Authority Act 1958 and with the objectives expressed in the VicRoads 1985 Code of Practice. • make the Chief Fire Officer of the Department of Sustainability and Environment a statutory appointment. • representing Victorian interests on operational matters in national committees. The State replace the Fire Services Levy with a property-based levy and introduce concessions for low-income earners. The State appoint an independent monitor or the Victorian Auditor-General to assess progress with implementing the Commission’s recommendations and report to the Parliament and the people of Victoria by 31 July 2012. The State consider the development of legislation for the conduct of inquiries in Victoria – in particular, the conduct of royal commissions. 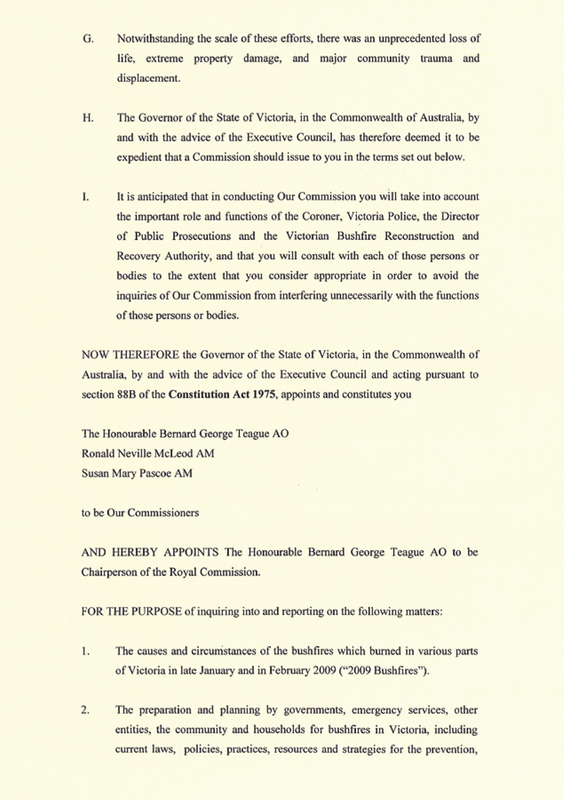 Following are the Commission’s terms of reference, as issued on 16 February 2009. The Commission focused on improving Victoria’s bushfire safety, so that the lessons learnt from the tragedy of Black Saturday will make the state a safer place. It offers this report and its recommendations to the Government and people of Victoria in memory of those who lost their lives.